T. filippovae is a large, oceanic pelagic squid that reaches a size of at least 520 mm ML in females and 400 mm ML in males (Rodhouse, 1998). Its size and abundance in the southwest Pacific suggests potential for commercial exploitation (Rodhouse, 1998). 7-13 teeth on largest club sucker. 12-14 sucker rown on club manus. Basal arm suckers with about 10 teeth but without alternating small teeth. Figure. Inner horny ring of the basal sucker of arm II of T. filippovae. Photograph from Rodhouse (1998). Right arm IV hectocotylized on the distal 21-36% of the arm length. Hectocotylized region with ventral protective membrane and trabeculae expansively developed. Figure. Hectocotylized right arm IV of T. filippovae. Drawing from Roper, et al. (1985). Club manus with 12-14 transverse sucker rows. Largest median manus sucker ring with 7-13 teeth. Figure. Inner horny ring of a large median manus sucker (tentacular club) of T. filippovae. Photograph from Rodhouse (1998). Diameter of largest median manus sucker 2.7-4.5% of ML. Two pairs of carpal suckers. Figure. Oral view of the tentacular club of T. filippovae. Photograph by D. Stevens. T. filippovae is very similar to T. sagittatus and T. angolensis. While the distribution of T. sagittatus is in the North Atlantic, those of T. filippovae and T. angolensis, are found in the southern hemisphere and overlap in the Benguela Current system, indian Ocean and off Australia. Much of the distribution data on T. angolensis is uncertain due to some initial confusion on the validity of the two species. (Dunning and Wormuth, 1998). In addition, Rodhouse (1998) concluded that "... the possibility should not be discounted that, across its geographical range, T. filippovae may represent more than one species." Type locality: Southern Indian Ocean at 35°S-38°S, 66°E-77°E. T. filippovae is considered to be an oceanic species whose populations encroach onto the shelf edge (Rodhouse, 1998). It has a circumpolar distribution from about 30°-50°S, and is found northward in the Benguela Current System off west Africa. A distribution map can be found here. Dunning, M. C. and J. H. Wormuth. 1998. The ommastrephid squid genus Todarodes: A review of systematics, distribution, and biology (Cephalopoda: Teuthoidea). . Smithsonian Contributions to Zoology, No. 586: 385-391. Rodhouse, P. D. 1998. 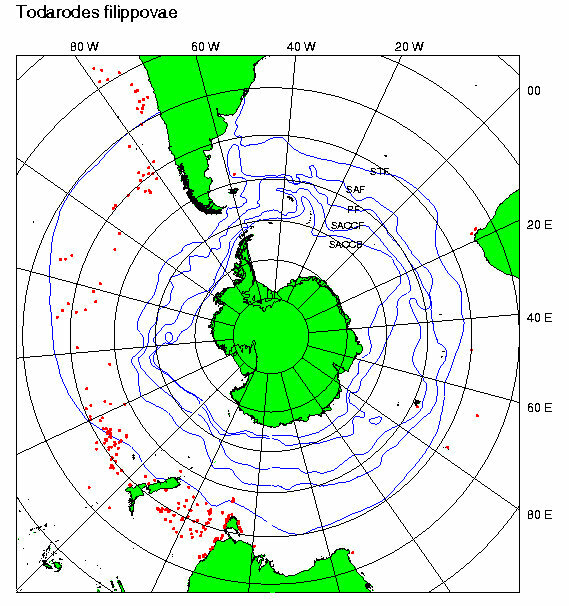 Todarodes filippovae in the Southern Ocean: an appraisal for exploitation and management. p. 207-215, In: Large Pelagic Squids, T. Okutani (Ed.) Japan Marine Fishery Resources Research Center, Tokyo, 269 pp. Roper, C. F. E., M. J. Sweeney, And C. E. Nauen. 1985. FAO species catalogue. Vol. 3. Cephalopods of the World. An annotated and illustrated catalogue of species of interest to fisheries. FAO Fish. Synop., (125)3:277 pp. Page: Tree of Life Todarodes filippovae Adam, 1975. Authored by Michael Vecchione and Richard E. Young. The TEXT of this page is licensed under the Creative Commons Attribution-NonCommercial License - Version 3.0. Note that images and other media featured on this page are each governed by their own license, and they may or may not be available for reuse. Click on an image or a media link to access the media data window, which provides the relevant licensing information. For the general terms and conditions of ToL material reuse and redistribution, please see the Tree of Life Copyright Policies.